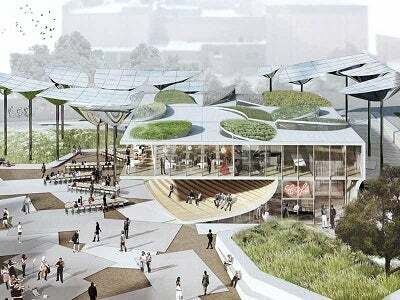 An OMA-designed restaurant will be one of the main attractions of the FAB Park and will also feature an edible roof. Image: ©MLA, OMA. The design by Mia Lehrer + Associates and OMA was selected through a design competition and will transform the site in downtown area into an iconic park. Image courtesy of MLA, OMA and IDEO. The frame of the Gallery will be enclosed by broad, green Oak and Sycamore trees, native to Southern California. Image courtesy of MLA, OMA and IDEO. The park will be frequented by variety of visitors including those from the City Hall, nearby offices and residents living close-by. Image courtesy of MLA, OMA and IDEO. First and Broadway (FAB) Civic Center Park is a proposed new park to be developed in downtown Los Angeles, California, US, as a public space promoting art, food and interactions in a unique urban setting. To be located on the busy and vibrant 217 W. 1st Street in downtown Los Angeles, the park is envisioned to be an iconic landmark spread across 1.96 acres. The Department of Recreation and Parks bought the land in 2013 with the aim of transforming it into a dedicated park land under the City’s ’50 Parks Initiative’. A competition was organised by the Bureau of Engineering, the 14th Council District Office, and the Department of Recreation and Park in collaboration with the mayor’s office to select a design for the development of the park. A team led by Mia Lehrer + Associates and OMA was adjudged the winner of the competition on 9 June 2016. "The new park is expected to open in 2019." The new park is expected to open in 2019. Designed to imbibe the qualities of a diverse city, the park is an exceptional destination for cultural events, interactions and gatherings. A large gathering place also known as ‘the Gallery’ is the centre of the park’s development and aligns itself to the City Hall. The Gallery as a central plaza has been designed to host large events and significant art installations, while offering scenic views of the City Hall. A diagonal passage across the park also connects it to the City Hall. The perimeter of the central plaza is surrounded by lush Oak and Sycamore trees, depicting the natural environments of Southern California. Sculpted canopies are arranged in a lively setting to provide shade and light while displaying the park’s overall design. Spaces in a series of expressed walls create intimate ‘Park Rooms’ all around the gallery to be used by small gatherings or art and cultural programmes. A wave-like ribbon is formed by these low-seat walls that offer informal seating spaces. Designed by OMA, the restaurant will be the centrepiece of the FAB Park and attract visitors from all corners of downtown. The restaurant is designed to have a variety of protected outdoor spaces along with a central dining area offering panoramic views of the park. An edible roof garden at the top of the restaurant is a reflection of the lively design of the park. The ground floor of the restaurant is crescent-shaped and blends effortlessly with the other structures present on the park’s north side. The ground floor will house a ‘Test Kitchen’, where new chefs will get an opportunity to prepare food and offer directly to the visitors at the plaza. A take-out counter located on the east-side of the building will be accompanied by an outdoor dining space and a bar. The northern-side of the building will have a beer garden, while a smaller indoor dining space will be present within the premises of the building. The test kitchen has been included as a venue exploring the diversity and seasonality of food and offering a holistic experience to the park-goer. Different events such as cultural happenings and city-wide festivals will influence the food offerings. The park and the restaurant will have an extensive range of visitors visiting the park at different times. To facilitate the needs of this diverse group, the restaurant has been designed to cater to quick and casual service at the ground floor while fine dine options are available at the top floor. The park is designed with sustainable features to offer low maintenance and achieve net-zero efficiency. With an array of features including solar collection, on-site storm water filtration/infiltration and an efficient landscaping plan, the park’s design promotes water conservation. The greenery included in the park’s landscaping enhances comfort, shade and beauty and reduces the need for water and maintenance. It succeeds in creating a ‘Golden California’ landscape. The restaurant and other programmes at the venue are designed to be self-sufficient. OMA is the design architect for the restaurant and the canopies in collaboration with IDEO, who will design the user-interface. The City’s Bureau of Engineering will be responsible for the project management. Marc Pally has been appointed as the art curator of the park, while Arup has been selected to provide engineering services. The civil work will be performed by Psomas and the lighting will be designed by Francis Krahe and Associates. SF-Kooperation is an international organization for leading manufacturers of building materials and concrete products worldwide.